Conceptual drawing of a supersonic biplane. The Concorde was the perfect means of oversea travel until expensive tickets, high fuel costs, limited seating and noise disruption from the jet’s sonic boom slowed interest, ticket sales and resulted in the Concorde being retired from service in 2003. Since then, engineers have been trying to come up with a new design that will be cheaper, quieter and more fuel-efficient and it looks like supersonic biplanes may be the solution. With Wang’s design, a jet with two wings — one positioned above the other — would cancel out the shock waves produced from either wing alone. Wang credits German engineer Adolf Busemann for the original concept. In the 1950s, Busemann came up with a biplane design that essentially eliminates shock waves at supersonic speeds. Normally, as a conventional jet nears the speed of sound, air starts to compress at the front and back of the jet. As the plane reaches and surpasses the speed of sound, or Mach 1, the sudden increase in air pressure creates two huge shock waves that radiate out at both ends of the plane, producing a sonic boom. Through calculations, Busemann found that a biplane design could essentially do away with shock waves. Each wing of the design, when seen from the side, is shaped like a flattened triangle, with the top and bottom wings pointing toward each other. The configuration, according to his calculations, cancels out shock waves produced by each wing alone. However, the design lacks lift: The two wings create a very narrow channel through which only a limited amount of air can flow. When transitioning to supersonic speeds, the channel, Wang says, could essentially “choke,” creating incredible drag. While the design could work beautifully at supersonic speeds, it can’t overcome the drag to reach those speeds. To address the drag issue, Wang, Hu and Jameson designed a computer model to simulate the performance of Busemann’s biplane at various speeds. At a given speed, the model determined the optimal wing shape to minimize drag. The researchers then aggregated the results from a dozen different speeds and 700 wing configurations to come up with an optimal shape for each wing. They found that smoothing out the inner surface of each wing slightly created a wider channel through which air could flow. The researchers also found that by bumping out the top edge of the higher wing, and the bottom edge of the lower wing, the conceptual plane was able to fly at supersonic speeds, with half the drag of conventional supersonic jets such as the Concorde. Wang says this kind of performance could potentially cut the amount of fuel required to fly the plane by more than half. The team’s next step is to design a three-dimensional model to account for other factors affecting flight. While the MIT researchers are looking for a single optimal design for supersonic flight, Wang points out that a group in Japan has made progress in designing a Busemann-like biplane with moving parts: The wings would essentially change shape in mid-flight to attain supersonic speeds. 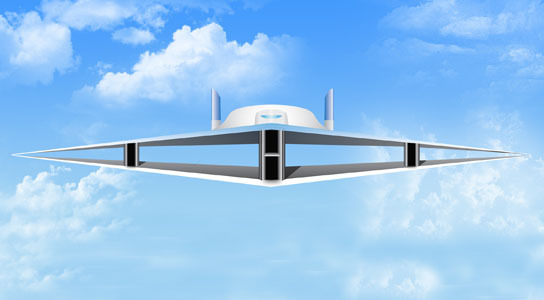 Be the first to comment on "Supersonic Biplanes, The Future of Travel?"